Ensuring that PHSA and its programs meet established benchmarks for cleanliness and food safety is an important priority for our organization. Participate in regular, province-wide independent audits of our housekeeping and food services operations. This allows us to compare ourselves to regulatory standards, best practices and to other similar facilities around the province. Conduct our own independent audits of housekeeping and food services operations to supplement the annual province-wide audits. These audits use a common set of tools that allows us to compare results achieved year over year, and provides a good method of tracking whether housekeeping or food services are improving or need improvement. It provides an independent qualified third-party assessment rather than relying on anecdotal stories from individuals, be they patients, residents, or others. PHSA participates in an annual province-wide housekeeping audit conducted across health authorities. Westech Systems FM, a BC-based company, conducts the audits. Audits are random and unannounced. Westech Systems visits hospitals and residential care facilities across BC to conduct audits of different rooms and locations representative of various areas of the site. Around 10% of all rooms at each site, or more than 10,000 hospital and care facility rooms, are inspected. Audits look at the cleanliness of toilets and sinks, and whether dirt or scuff marks have been removed from hard floors. They scrutinize objects and surfaces above eye level to ensure high dusting is taking place, and search for stains and built-up dirt in other areas. Reports also identify problem areas. The rooms and their facilities are then rated on a score out of 100. Our housekeeping and food service audit reports are available for the public to view. BC’s six health authorities scored an overall average of 91.3 per cent – considered an “Excellent” rating – in Canada’s first-ever province-wide independent audit of safe food handling in hospitals and public health system-managed long-term care facilities. The safe food handling audit is the first of three made-in-BC assessments being developed to audit safe food-handling practices, gauge patient and resident satisfaction with food served, and determine the nutritional adequacy of foods served in health-care-managed facilities. The joint health authority Food Services Technical Team includes clinical dietitians, public health inspectors and food service managers from the six provincial health authorities. The team worked with Steritech, an independent company chosen by an RFP process, to develop the tool to measure safe food handling levels and conduct the audit. "It is important to establish a baseline measurement of safe food preparation standards,” added Murphy. “Only by having a baseline measure are we able to examine whether we making continual progress in the future – and we are proud to be leading all Canadian jurisdictions in establishing this baseline data." Any critical issues unique to specific facilities were dealt with by health authorities quickly, in some cases on the spot. A number of relatively minor issues common to many facilities were identified, such as a few instances of improper sanitation solution concentrations, and these are also being rectified through authority action plans. The Food Services Technical Team is continuing work on the other two aspects of the overall provincial audit, including a patient/resident food satisfaction survey and an assessment of the nutritional adequacy of food served. The first satisfaction surveys are currently being administered. Because of planned changes to the Canada Food Guide and the need for all hospital and care facilities to implement menu changes based on this update, it is anticipated that the nutritional adequacy assessment RFP will go out in late 2007. Results from each of these measurements will also be made public. Steritech’s report of safe food handling audit results for the 149 individual facilities reviewed will be posted to health authority web sites. The audit was conducted between April and June of this year and was designed to complement ongoing in-house audits conducted by health authority public health inspectors. All facilities currently follow provincial and national safe food handling and service standards. The Provincial Food Audit follows the same province-wide joint approach taken last year to assess the cleanliness of all health authority facilities. Having common tools and consistent processes helps improve accountability and service delivery to patients by providing an objective measurement and information to quickly deal with any concerns that are identified. *No authority or facility scored in the “Poor” (below 70%) range. By developing a common, independently audited set of province-wide standards, BC health authorities will ensure that best practices can be shared more easily and quickly. The audit will also establish benchmarks that are consistent for all health facilities, thereby assisting with quality assurance and quality improvement. In 2003, PHSA entered into an agreement with private sector contractors for food and housekeeping services at BC Children's Hospital, BC Women's Hospital & Health Centre, BC Cancer's Vancouver Centre, and Sunny Hill Health Centre for Children. PHSA decided to contract out non-clinical services such as housekeeping and food services to focus our health care dollars on our number one priority—patient care. At that time, PHSA made a commitment that contractors providing cleaning or food services in PHSA's agencies would meet strict performance standards, and be subject to regular monitoring and assessment to make sure that those expected standards for cleanliness and quality were met or exceeded. As part of our regular monitoring and assessment, third-party evaluations of food and housekeeping services were conducted to ensure that performance standards were being met. The audit found that Crothall Services Canada achieved an overall rating of 79%, compared to 73% when housekeeping services were done in-house. Food safety performance—such as food handling and storage—has increased at all facilities since contracting out. 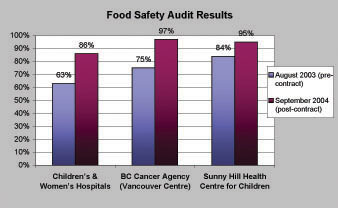 At BC Children's Hospital and BC Women's Hospital & Health Centre, food safety performance increased from 63% to 86%, at BC Cancer it increased from 75% to 97%, and at Sunny Hill Health Centre for Children it increased from 84% to 95%. A patient survey found a high level of satisfaction with food services since they were contracted out. Food services received satisfaction ratings of 84% at BC Children's Hospital, 91% at BC Women's Hospital & Health Centre and 83% at BC Cancer. Contracting out food services and housekeeping is benefiting both patients and taxpayers. We are saving $5 million per year from outsourcing non-clinical services — money that is being redirected to protecting patient care. As the graphs below show, the quality of service for housekeeping and food services at PHSA facilities has been maintained since the contracting out of non-clinical services. Third-party audits were conducted of housekeeping services in February 2003 (pre-contract), and again in October to December 2004 (post-contract). The audit found that quality was generally maintained since the services were contracted out. The weighted average represents the average score of all facilities based on square footage. A third-party audit of food safety standards was conducted at PHSA facilities in August 2003 (pre-contract) and again in September 2004 (post-contract). The audit found that food safety performance standards—such as food handling and storage — have been enhanced since food services were contracted out. 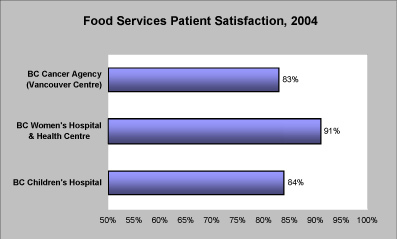 A third-party survey of patient satisfaction levels with food services at PHSA facilities was conducted in the fall of 2004. The survey found a high level of patient satisfaction with food services since they were contracted out. At which PHSA facilities have housekeeping and food services been contracted out? Housekeeping at BC Children's Hospital, BC Women's Hospital & Health Centre, the Vancouver Centre of BC Cancer and Sunny Hill Health Centre for Children have been contracted out to Crothall Services Canada. Patient and retail food services at BC Children's Hospital, BC Women's Hospital & Health Centre, the Vancouver Centre of BC Cancer and Sunny Hill Health Centre for Children have been contracted out to Morrison Healthcare Food services. Why are housekeeping and food service performance standards at these facilities being audited? When PHSA announced its decision to contract out non-clinical services, it made a commitment to our patients and staff that any contractor providing cleaning or food services in one of PHSA's agencies would meet strict performance standards, and be subject to regular monitoring and assessment to make sure that those expected standards for cleanliness and quality were met or exceeded. What did the evaluations find? Third-party evaluations found that the quality of housekeeping and food services has been maintained since they were outsourced by the PHSA last year. It means that PHSA's facilities are clean and safe. They are as clean and safe today as they were before contracting out. Beyond that, we are always aiming for continuous improvement. How rigorous are your standards for housekeeping? Our standards are among the most rigorous in North America. In fact, we raised the bar when we decided to contract out. We chose to set our post-outsourcing housekeeping standards higher than our previous standards – for example, increasing the frequency of cleaning in areas, and adding new requirements such as cleaning toys at Children's Hospital. We also chose to set the target in evaluating performance against the new standards higher than our previous target. The new target for the enhanced standards is 85%, while the old target for the old standards was 75%. This is because we are aiming for continuous improvements in the quality of our services. The important thing for patients and their families to know is that our facilities are clean and safe. How much money has been saved as a result of contracting out housekeeping and food services? Contracting out food services and housekeeping is benefiting both patients and taxpayers. We are saving $5 million per year from contracting out non-clinical services — money that is being redirected to protecting patient care. When were performance standards measured and how often will they be measured in future? Food safety standards were measured by a third party before the implementation of contracting out agreements in August 2003. The first annual audit to measure the contractors' performance was conducted in September 2004. 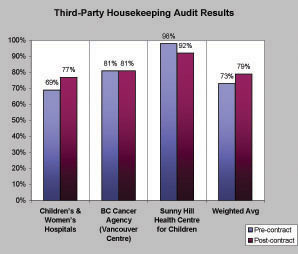 A third-party housekeeping audit was first performed in February 2003. The first annual audit of the contractors' performance was initiated the week of October 18, 2004 and completed the week of December 6, 2004. The patient satisfaction survey was conducted in the fall of 2004 and the report from Research Strategy Group was received on October 22, 2004. We are committed to conducting third-party audits on at least an annual basis. Third-party auditing firms specializing in food safety and environmental standards were hired to conduct these audits. Regarding food services, Steritech conducted the food safety audit and the Research Strategy Group conducted the patient satisfaction audit. Daniels Associates conducted the housekeeping audit.